The Direct Inject Pumping System is designed for injecting concentrated TriCure AD and other high viscosity liquid chemicals. While most standard metering pumps cannot accurately dispense high viscosity liquids such as concentrated soil surfactants, the new Direct-Inject System is designed to do so easily and accurately while saving money and needed space. This pumping system includes the pump, adjustable stand, fittings and calibration tube making set-up and use easy and dependable. 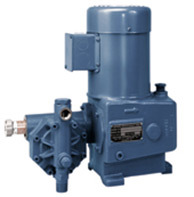 Our MP-7 pump from Neptune offers durability and accuracy when used for injecting pre-diluted or low viscosity liquids. This pump can be ordered with or without the pump kit which includes adjustable stand, fittings and calibration tube. For more information on the benefits or cost of the direct inject pumping system, please contact us at 1-866-436-0500 or info@tricure.com. A better way to apply TriCure AD™ for protection against Localized Dry Spots and water-repellent soil. An upgrade to the existing hose-end pellet applicators for dispensing TriCure Pellets is now available. Our new applicator has a better, more durable valve and nozzle, and a new design for water rotation within the chamber to help pellets dissolve evenly. The Liquid-Pro applicator provides an alternative to spray rigs and back-pack sprayers for applying TriCure AD. This applicator makes it easy to apply high-viscosity liquids through a hose application by metering the proper fluid volume for a given spray area. Contact us at 1-866-436-0500 or your local TriCure distributor for more information and pricing.